North was absent on Saturday as the Saints slipped to another defeat. 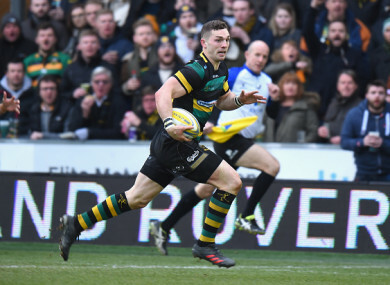 ALAN GAFFNEY SUGGESTED Wales wing George North had no interest in playing for Northampton after he missed their 34-25 home defeat by Sale in the Premiership on Saturday. North is set to leave the Midlands club at the end of the season to play regional rugby in Wales. Having just returned from injury, it might have been thought North would need game time in order to regain his starting place in Wales’s side for next weekend’s Six Nations international at home to Italy. As it was, North was nowhere to be seen as Sale all but put the result beyond doubt in a first half that ended with them 31-6 in front after Denny Solomona ran in a hat-trick of tries, with fellow flyer Marland Yarde also crossing the Saints’ line. Gaffney, Northampton’s interim head coach, was in no mood to cover for North when asked about the Wales star’s whereabouts. The veteran Australian coach added: “I haven’t spoken to George personally about it, but I’m just disappointed he wasn’t here. Meanwhile Sale supremo Steve Diamond was delighted by the performance of New Zealand-born England wing Solomona, who recently agreed a new deal to stay at the northwest club. “Denny has just signed a four-year contract with us and he’s fantastic,” said Diamond. Defeat left Northampton 10th in the 12-team Premiership, with the only consolation for the Saints being that basement club London Irish now appear to be firmly cast adrift in the lone relegation spot. The other top-flight match to survive the weather on Saturday saw Newcastle hold out for a narrow 21-20 away win over Gloucester at Kingsholm. Back-up fly-half Joel Hodgson, brought in following the late withdrawal of ex-England international Toby Flood, proved the difference as he kicked three penalties and a conversion in a match where Gloucester were unable to add goal-points to any of their three tries. Victory saw the Falcons soar to third in the table and was a fine reward for the travelling Newcastle fans who braved the weather to make the long journey from the northeast to southwest side Gloucester’s Kingsholm base. “Floody dropped out late on with illness and, though it’s never easy, Joel slotted in easily and did a really good job,” said Newcastle director of rugby Dean Richards. “He knows our systems as this was his 50th appearance for the club. Email “Gaffney angry at North's Northampton no-show”. Feedback on “Gaffney angry at North's Northampton no-show”.